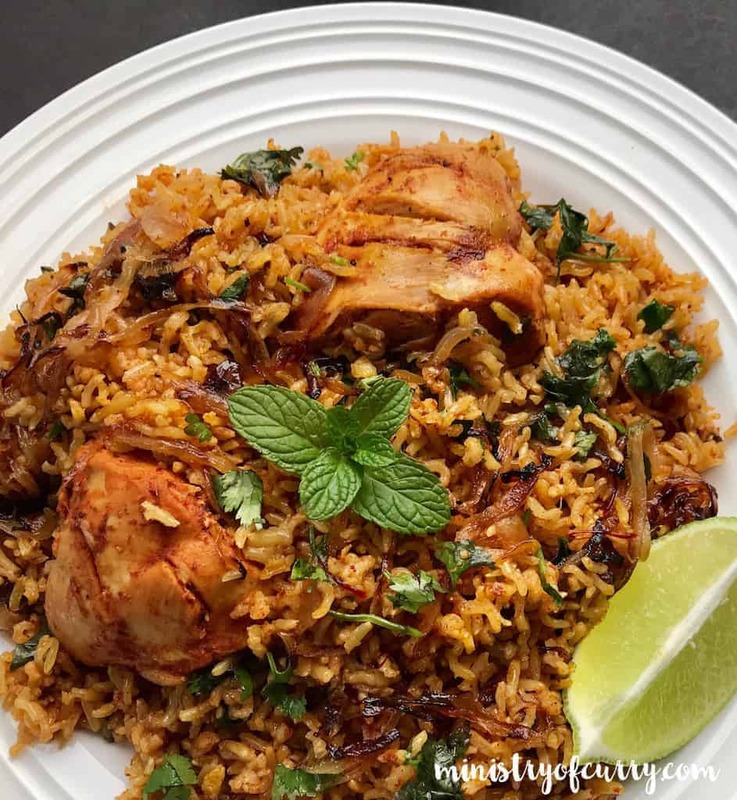 Brown Rice Chicken Biryani – Took me much longer than anticipated, but after several trial and errors, here is the recipe that I am excited to share with you all. 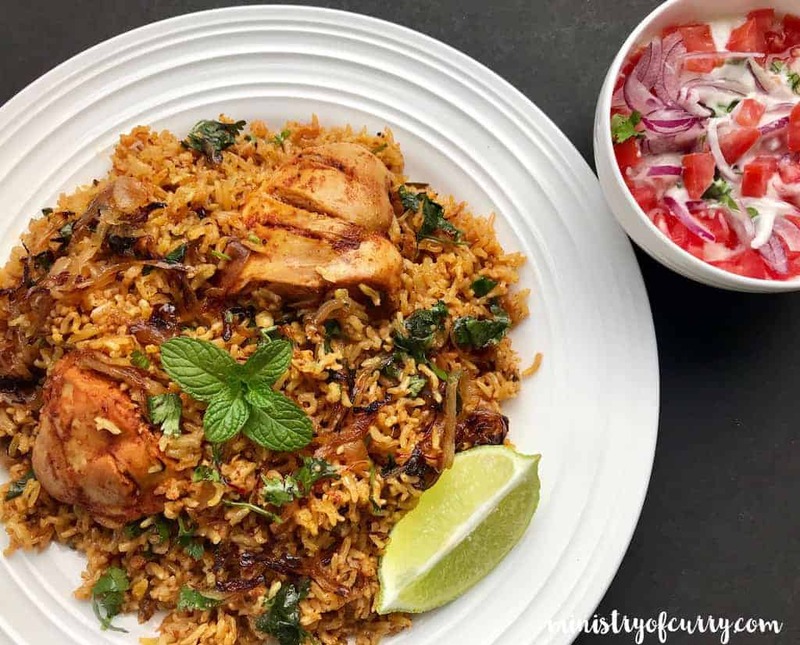 A healthier version of the popular Chicken Biryani that is cooked with brown basmati rice, chicken breasts, fresh herbs and warm aromatic spices. I would have never thought of making Biryani with brown rice. Since I started making Biryani in my Instant Pot, it has become a repeat one-pot meal in our family. 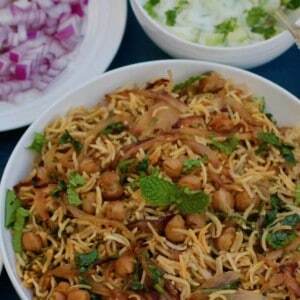 It is a favorite in our house and making it with brown basmati only makes it more healthier. 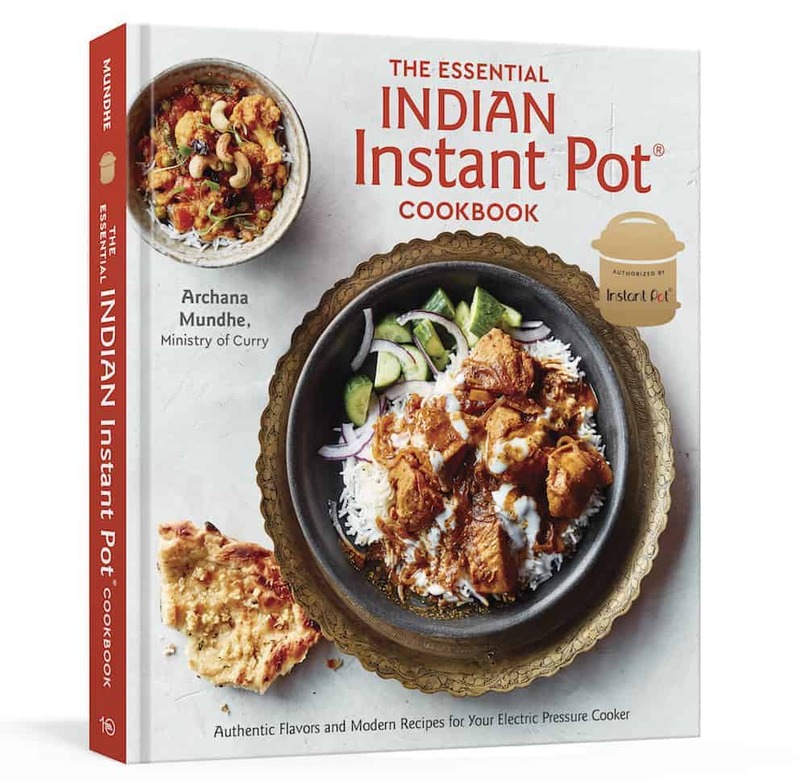 After posting my Instant Pot Chicken Biryani recipe I received so many questions on how to make this with brown basmati. My initial thinking was that it is not going to work out with the flavor and moreover the textures with the chicken and Rice cooking together. But more I started using brown rice, I understood how soaking it can drastically change the cooking time especially with Instant Pot. So here is the recipe, and seriously all it needs is some extra prep-time or a little bit of planning. The key is to soak the brown basmati rice for 3 hours in warm water and marinade your chicken breasts for 2-3 hours. Once you have the brown basmati soaked for 3 hours, it cooks perfectly along with the chicken breasts in 10 minutes of pressure cooking time. 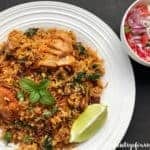 Unlike the regular white rice Chicken Biryani, this recipe requires natural pressure release, which helps the rice to continue to cook and the chicken breasts come out moist and juicy. 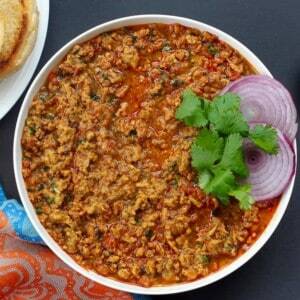 Served with a yogurt-based raita, boiled egg and fresh lime wedge makes this a hearty one-pot meal that is finger-licking good and satisfying! Drain the rice and gently pour over the chicken. Spread the rice evenly over the chicken. Add 1-1/2 tsp of salt. Add 1 cup of water. What is the brand of brown rice here? I used Trader Joe’s brown basmati! Wow.. this looks so yummy.. one quick question, do I need to add 1cup of water for 1cup of rice or 1cup water for 2cups rice ? Hi Ramya, lots of liquids are released by pressure cooking the chicken, so just 1 cup water is enough for 2 cups of soaked basmati rice. You want to make sure that all the rice is under liquids as shown in the video. Let me know if you have any questions. When you say one cup of rice, do you mean the cup that came with the instant pot? Also, the instant pot cooking times state that it takes 20-22 minutes to cook brown rice. Your recipe cooks everything in 10 minutes – is that because the brown rice has been soaked for three hours? I use regular measuring cup for rice. The key is to use same cup to measure the rice and water. And yes soaking reduces the cook time for brown rice. Ok ok, so you mean for this particular recipe you used a regular measuring cup (250ml)? But, you can use any quantity as long as the ratio is consistent? (1:1 or 1:1.25)? 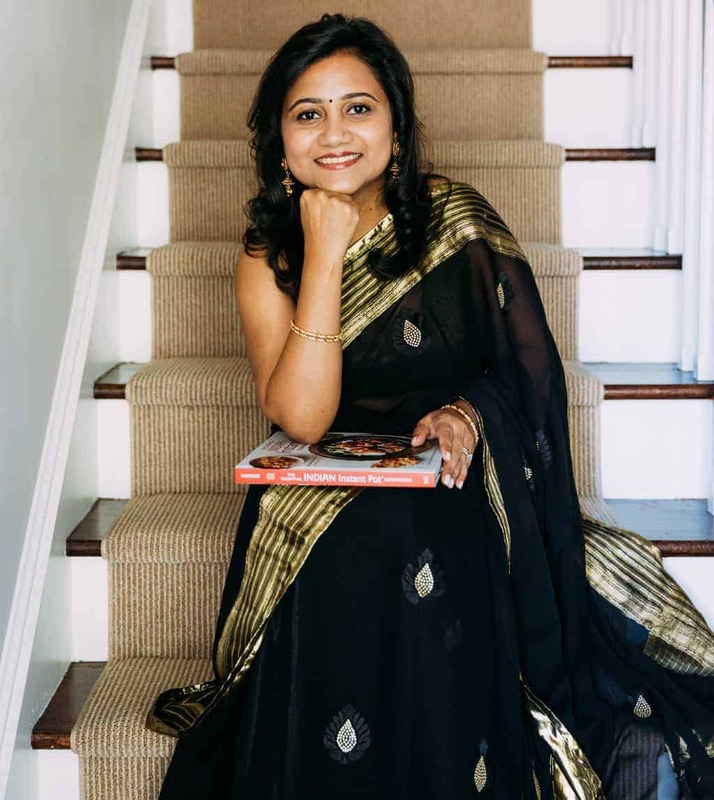 I use the Sundari brand of brown basmati that cooks on the stove in 18-20 minutes, so in the instant pot it just takes 6 minutes on high pressure, with just 20 minutes of soaking. I guess it all depends on the particular brand you use, some brown basmatis take 45 minutes on the stove. Hi Archana! first of all, I must say I am hooked on to your recipes & specially the IP ones! It wont be a lie if I say I bought IP after reading your blog & reviews on IP 🙂 All the recipes I have tried so far have come out so well. You have a very good knack of explaining everything in simple words, really very impressive to know inspite of being from IT background, you are doing this to pursue your passion for cooking! Now quick q on this recipe. Can I follow this same recipe to make egg biryani? only thing I am little unsure is how to marinate boiled eggs, is that even needed. Hi Seema! Thank you for your kind words. 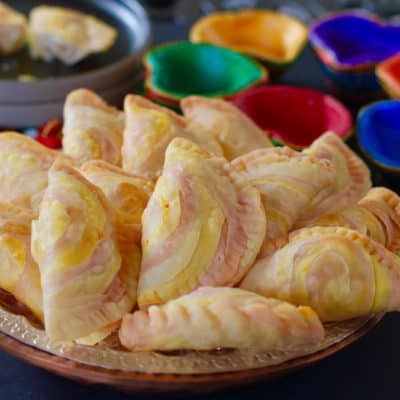 I am happy to hear that you are enjoying the new cooking experience. I would not marinade eggs. I would cook the brown rice with sautéed onions and half of the marinade. Then sauté whole boiled eggs in remaining marinade and onions on stovetop. And then simply mix the 2 together. I made this today, and the rice was still a bit grainy. I had added more water – around 1.25 cups to the 1 cup of rice – just to get it all under water, but after 10 minutes at high pressure and around 28 minutes natural pressure release, it was dry. Another 10 minutes at Keep Warm didn’t change much either. I might try it again with 15 minutes’ time on the pressure, but it was still delicious. I wasn’t ever really a biryani fan since most biryanis I ate were kind of low on the flavor scale, but the marinade was dynamite. Hi Mike, Was the rice soaked before? 15 minutes will work good for the rice but I am afraid the chicken may be overcooked? Try soaking in warm water for a little bit longer? Yep, it was soaked in warm water for 3 hours. Maybe I should soak the rice in hot water next time? 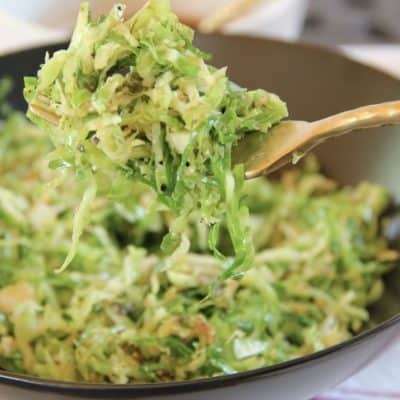 For what it’s worth I was using Deep Foods brand brown basmati rice – not sure if that necessitates any changes. Hi Mike, I have used Deep Basmati and it works week for me. Soaking in hot water might break the rice grains. Try soaking for longer time, around 4 to 6 hours. Let me know how it works out. Also lately I have been using trader joe’s brown basmati. Although I do not think there is much difference. Depending on the age of the rice the cook times might change. 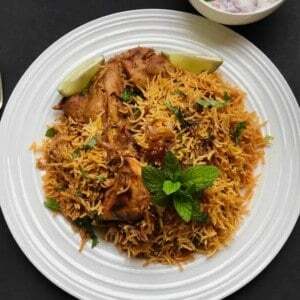 Hi Archana, I wanted to try making this biryani with Brown sona masoori rice. Any idea if I should change the cook time? Hi Shreta! Same cook time will work for sona masoori brown rice. Do you keep the instant on the “keep warm” setting while it is doing natural pressure release? Can I use regular brown rice? Does it have to be basmati brown rice? Hi Alvina, yes you can use regular brown rice. 1. Pressure Cook the marinated lamb for 20-25 mins on meat/stew setting. Then add the soaked brown rice and follow the remaining recipe. 2. Pressure Cook the marinated lamb for 15 mins on meat/stew setting. The add unsoaked brown rice, with extra 1/2 cup of water and cook for 20 mins with natural pressure release.